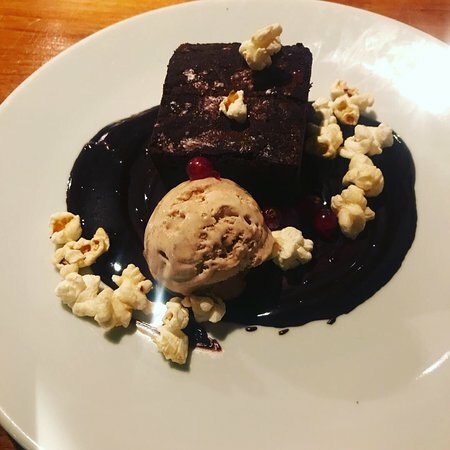 02/01/2019: We have been meaning to go to this restaurant for ages and we managed it on my birthday last week. 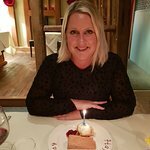 What an experience it was - the most special birthday meal I have had in years. A couple of weeks before we received the menu and we chose four course each as they suggested that this was best and it was! We arrived in the small intimate restaurant and each of our menus was typed out and presented on our table for us - it was very nice. Beth has the most charming smile and couldn't do enough to help with serving us and the food cooked by Carl was absolutely amazing. I had a chestnut millefeille which was so tasty and unusual for a starter, following homemade tasty bread! This was followed by home-smoked sea trout on a poached egg and homemade muffin with a beautiful hollandaise sauce. The combination of flavours was superb and the sea trout was by far the best I have ever tried. The main of wild boar en croute had the most incredible damson jus to go with it and my hazelnut and medlar icecream was a lovely end to a fabulous meal. The wine and even the coffee afterwards was also excellent. This place is a hidden gem and I know they are moving premises soon so can't wait to hear where they end up because I would travel miles to eat here again. A stunning unforgettable meal. 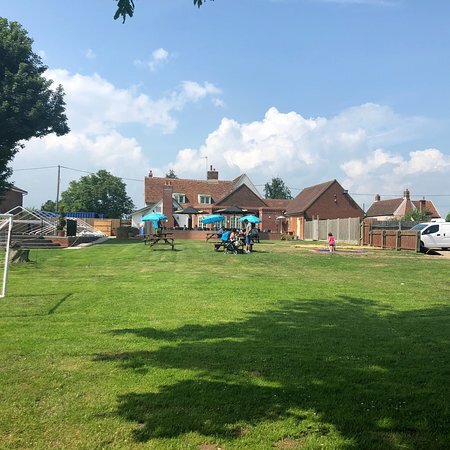 13/04/2019: Went for lunch today at the red lion as not been there for over 12 years and before that since it was a traditional pub! My mum grew up in the village so I treated her to lunch there!! 06/04/2019: Excellent food, and top star service. Lovely and welcoming atmosphere will definitely be returning!! 12/04/2019: We popped in here for a cuppa and cakes, it was absolutely lovely. The cake I had (an apple crumble cheesecake I think) was superb, and everyone else loved theirs too. Really nice people too. 20/03/2019: Popped in for lunch, very welcoming couple, menu from full English to scones and cake. 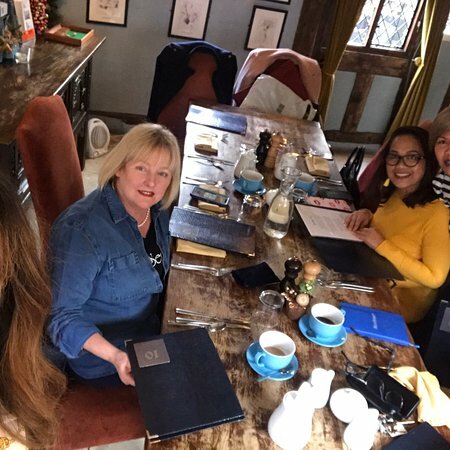 18/04/2019: Wonderful authentic tearoom, obviously put together with much love and passion! Two sisters run the place with a smile and make you feel feel most welcome. The home made cakes are delicious, also highly recormended the toasted tea cakes and the scones, jam and clotted cream... All served with lashings of hot tea .... we went twice within one week .... both visits were exceptional... look out for the collection of teapots and China lovingly collected .... well done ladies! 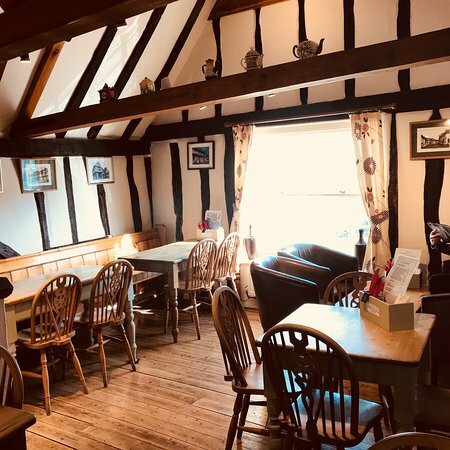 18/04/2019: There are many tea rooms in Long Melford, but the one favoured by locals is The Long Melford tearoom, run by Therese and Tracey. 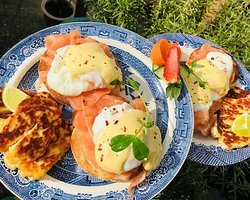 We have been many times and always enjoy the lovely sandwiches, toastier and wonderful homemade cakes and scones. Even our expectations where surpassed when we took three of our grandchildren for an afternoon tea. They are 3 (twins) and 5. The array and quality of tea sandwiches, cakes and scones was amazing, beautifully presented with no effort spared. They made it a very special occasion. They are always busy, deservedly and always have a friendly word for everyone. This is a special place, thank you! 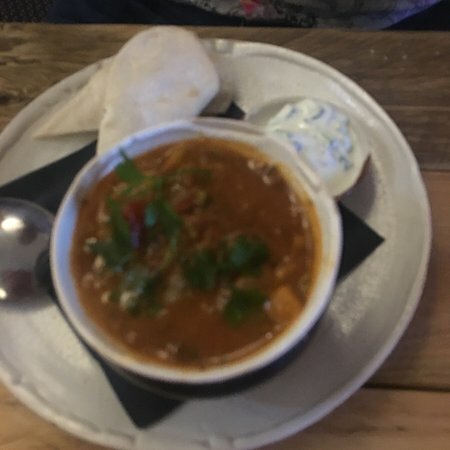 13/04/2019: This is our third visit to Scutchers and the experience has been top notch on each occasion. 11/04/2019: Our first time here as new comers to Suffolk. Had a great time - pleasant ambience, friendly service and varied and interesting menu. They catered for my gluten-free husband with great care. 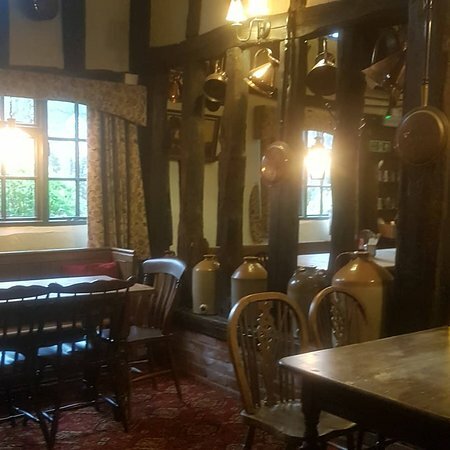 13/04/2019: We popped into this lovely , traditional county pub for a drink on a Thursday night and were greeted by friendly bar staff. Our food was good quality and unpretentious pub grub. We thoroughly our evening, as did our dog who made friends with the bar staff. 06/04/2019: We was so please to stumble over this Gem. Beautiful charactered building! Attentive staff. Beautifully clean. What's more, the food was so fresh and delicious. Will definitely be returning! 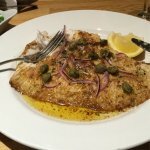 17/04/2019: lovely atmosphere, good food and service. Eggs Benedict for both of us. Eggs were perfect, and ham very nice. lovely and filling! 13/04/2019: We stopped for a break here during a shopping visit. It is our favorite teashop in sudbury since the new owners moved in. 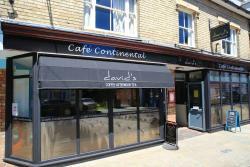 We only had a scone but the place was buzzing with other customers having lunch and cakes. Looking at the menu our next visit will be for lunch. The 'staff' were very pleasant. The scones had nice 'extras' with pieces of fruit. All at a very reasonable price. 13/04/2019: Great home cooked food with great veg Good curry plus steak and kidney pudding Used to be a tudor weaving house now lovely Inn. Good service at reasonable prices. Lovely tudor rose ceiling. 29/03/2019: Never been in this area before, coming from Brighton en route to Suffolk Escapes. 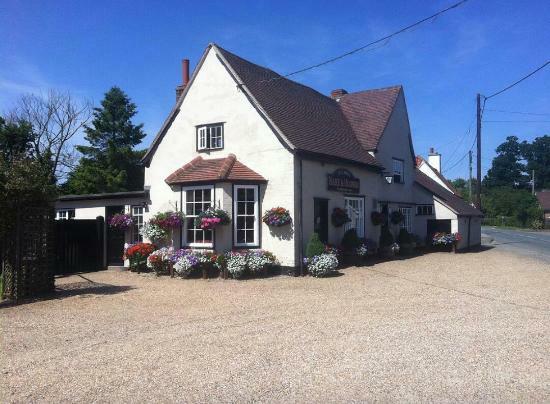 Found this gem of a pub off the beaten track and loved it! Monday afternoon, yet a lovely warm welcome, great atmosphere and a menu to blow you away!! 16/04/2019: Dropped in here while staying at The Swan. The lunchtime soup we had was impressively tasty so we returned on Sunday evening for pizza. One of the nicest pizzas I've had. Will definitely return! 16/04/2019: Had a walk in meal and food great. What my wife and mother did not appreciate was the young people calmly discussing drugs and obviously taking them. Also staff taking part in chats then doing it. We don’t have drugs where we live up north and don’t expect it in a little beautiful village. One young woman working there obviously high. Shame as would have gone back. 12/04/2019: We meet a friend who lives in Ipswich ( we live in Colchester) twice a year. Many years ago we always met at the Bull but unfortunately we stopped going there as the food was terrible. Last week we decided to try again and what a wonderful experience. The food was excellent and the waitress was very friendly and always smiling. On reading down the reviews it must have been over 7 years since we have been there, but it won’t be 7 years before we return. 14/04/2019: Walked past early morning and this cafe/deli/bar caught our attention. Looks cosy we thought and made sure we went back when it was lunchtime. 31/03/2019: Was invited here by my sister who is a local and I was very impressed. A small place with great ambience and friendly owners who made us very welcome. The food was excellent and I can honestly say the steak was one of the best I’ve ever eaten! 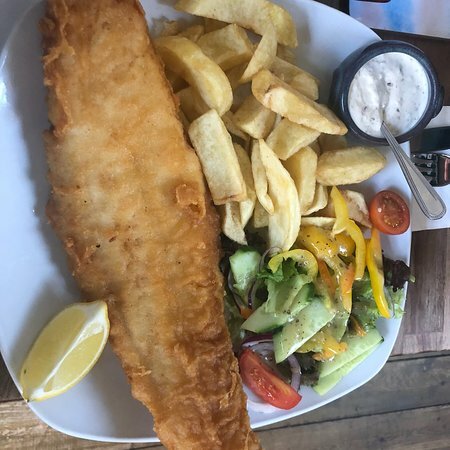 18/04/2019: Great food can choose battered or grilled skin no skin the options are all there. for both takeaway or eat in. The restaurant portions are generous and good quality. Worth a try. 25/03/2019: The restaurant is expensive for an average high street restaurant. Service poor...I ordered Merlot wine (medium dry) and was given Zinfandel (sweet). When I questioned the waitress she told me there was no Merlot..this was not discussed with me on ordering. Will not visit again. 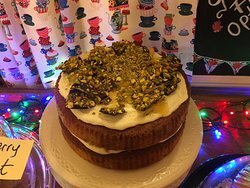 14/04/2019: A small but very friendly cafe with a fantastic range of cakes to choose from. You can also take cakes away and a box is provided free of charge for you. 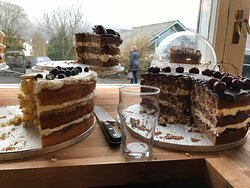 08/04/2019: My husband was drawn into this cafe by the sheer size of the cakes, but it was definitely a case of size not living up to expectations. They looked amazing, but sweet and sickly and lacked in any definite flavours. 13/04/2019: Low key experience- quite a change from the old ‘haute francaise’ experience... some excellent dishes still - the salty belly of lamb was a revelation and the cheese board is strong- but too much is ordinary and the deserts on the stodgy side... the ‘foams’ (les écumes)across the board became a little wearisome, as if the chef had only one trick even if the amuse-bouche one was genuinely fun! 13/03/2019: Beautifully decorated with a welcoming and professional staff, we were quickly made to feel at home. It was a small but well thought out menu, and the food was out of this world. 11/04/2019: For starters we had whole brie with chutney. For main course we had the chateaubriand which was exquisite. I will be back! 01/04/2019: The visit was for Mothers Day, therefore by definition it was going to be busy. It was, but this was no problem for The Angel.